The ProCeas® is a complete pre-calibrated multi-component analyser based on the enhanced IR Laser Spectroscopy method OFCEAS. The ProCeas® features the association of a performant spectrometer with a Low Pressure Sampling (LPS®) system (50-100 mbar absolute) for the online analysis of several key gases in industrial, environmental and OH&S applications. The association of the OFCEAS and LPS® technologies enables high spectral resolution, interference free, fast and sensitive analysis, regardless of the matrix of the gas to be analysed. Thanks to the low sampling pressure (100-50 mbar), the ProCeas® system fits a large range of applications without the need to heat nor dry the sample prior analysis reducing considerably installation, operation and maintenance related costs. The ProCeas® is a true direct extractive process gas analyser developed and patented worldwide by AP2E (France). 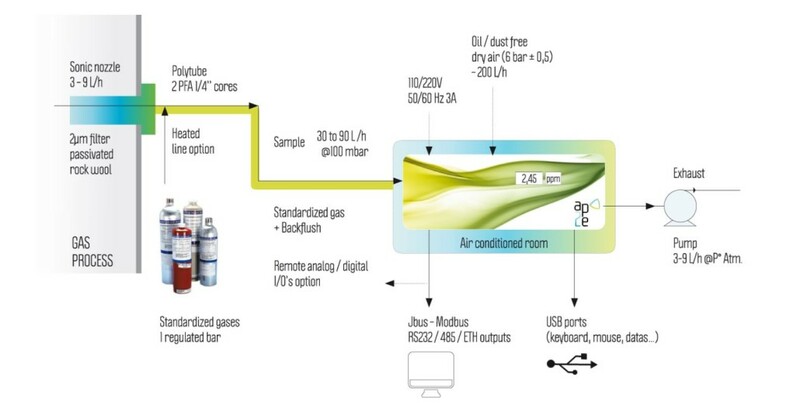 True Direct Extractive Process gas Monitoring system (No sample treatment) 50 – 100 mbar abs. sampling pressure removes any risk of chemical adsorption, desorption and condensation along the sample line. Low maintenance – The LPS® system allows flow low rates within 3 and 9l/h without affecting the response time and reducing considerably dust and materials build-up. Interferences Free – OFCEAS technology provides exceptional selectivity, enabling simultaneous monitoring of multicomponent without interferences, regardless of the gas matrix. Ease of integration – The ProCeas® allows digital (Ethernet, RS485, RS232, ModBus) analogue and TDR IOs. No Drift – The zero is contained in the signal, enabling automated and intrinsic zero drift compensation. Field proven – The ProCeas® is free of optical moving part and was designed and built strictly for industrial and on-board mobile applications. The OFCEAS technology essentially differs from the CRDS (Cavity Ring Down Spectroscopy or Spectroscopy by resonance damping time) technology by its feedback principle: a part of the emitted radiation is returned from the chamber to the laser, enabling the tuning of the laser and the cavity resulting a resonance phenomenon. With a volume of only 15 cm3, the measuring cavity or cell is equipped with mirrors whose reflectivity exceeds 99.99%, providing an optical path between 1 and 10 km (approx. 10 meters in conventional technologies). The immediate consequence of this phenomenon is the identification of very intense absorption peaks with a very narrow spectral width. Given that the source used is a continuous laser, the system presents very high measurement stability: there is no zero drift and no need for new calibrations. Optical Feedback Cavity Enhanced Absorption Spectroscopy: technology developed and patented by the University Joseph Fourier (France), coupled to a Low Pressure Sampling(100 mbar absolute) developed and patented worldwide by AP2E, for the on-line analysis of different gases. By the end of 2010, after two years of R & D studies, the AP2E ProCeas®was the award recipient of the USA “R & D 100” which rewards the 100 most innovative global technologies of the year. In coal and gas fired power stations, cement kiln, foundry, paper mills… Stringent regulatory requirements for emission monitoring and reporting. The LaserCEM® enables efficient and flawlessly compliance for a large range of contaminants. For DeSOx, DeNOx, Scrubbers, catalytic reactors and particulate filters, the LaserCEM® provides real-time measurement to optimize removal efficiency resulting in significant savings of material and to less maintenance for plant operators. The ProCeas® Combustion is a complete pre-calibrated laser infrared spectrometer designed for continuous and simultaneous monitoring of CO and O2 in large combustion plants. 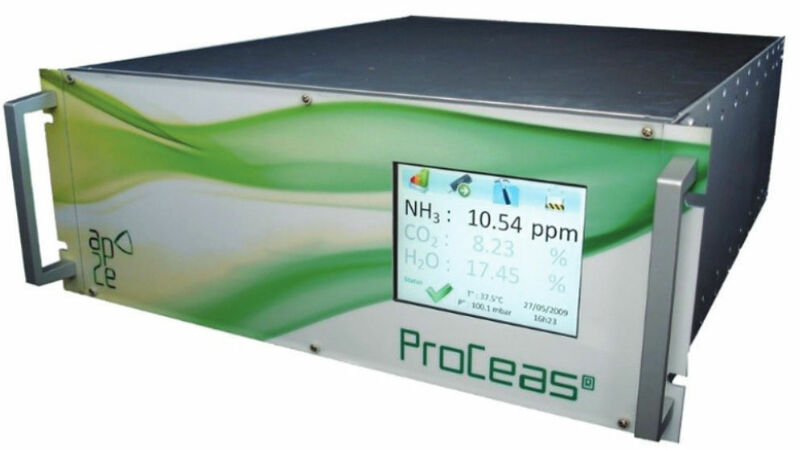 The ProCeas® BIOGAS SYNGAS is a complete pre-calibrated laser infrared spectrometer of rapid rela-time measurement of H2S, CO2 and CH4 for methanization process monitoring. The ProCeas® H2S is a complete pre-calibrated laser infrared spectrometer designed for online monitoring of low level of H2S in natural gas and liquefied natural gas (LNG). The ProCeas® H2 Trace is a complete pre-calibrated laser infrared spectrometer for online monitoring of H2 and H2 traces in chlorine gas matrix.